There’s no doubt about it, the holiday season can get pretty hectic at home, especially with all those holiday decorations, travel plans and the frigid weather to boot. Fortunately, Camp Bow Wow’s training and behavioral expert, Erin Askeland, recently sat down with Bekah from Motherhood Moment to discuss a few ways to keep your pets safe from all three! Never underestimate the curiosity of a dog! Erin suggests keeping these tips in mind when decorating and rearranging your home for the holiday to keep your pet out of mischief and safe from any potential hazards. See the world through their eyes. Get down on their level and have a look around. Those shiny, low-hanging ornaments for example are sure to catch your pet’s eye if they catch yours. Hide away your wires. Don’t let extension cords and wires from holiday lights lay low, or you run the risk of your pet becoming tangled in or chewing them. Instead, tape them up and keep your pup as far away from them as possible. Keep candles up high. Fido’s feisty tail can easily knock over that holiday candle and cause a house fire, completely on accident. Avoid damage and injury by keeping lit candles well out of your pet’s reach. Traveling with your pet can be stressful for the both of you, not to mention dangerous if not done properly. The tips below can help you have a safe and happy trip home for the holidays. Introduce them to their carrier. If you’re traveling with your pup via plane, you’ll want to make sure they’re acclimated to their crate or carrier before travel. This will help reduce stress on their voyage. Purchase a dog seatbelt. The odds of getting into a car accident are significantly higher during the rush of holiday travel. For this reason, Erin suggests purchasing a simple doggy seatbelt or car seat to keep your dog safe during the drive. Make them comfortable. No matter how you travel, bring along their favorite blankets and toys to keep them calm during the journey. You’re not the only one who can get sick more easily when the temperature drops. Keep your pets safe and healthy with these simple tips. Keep them dry and warm. Always dry off your pet thoroughly when he or she comes in from playing in the snow. This will help ensure they don’t catch a cold, and will also keep any toxins from ice melt off their fur. Consider purchasing a jacket for your pet as well. Melt ice carefully. Read labels thoroughly and select an ice melt product that’s nontoxic. Provide plenty of water. 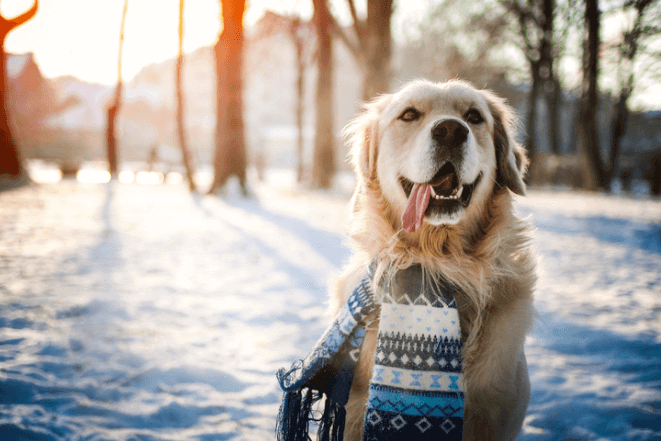 Avoid having your pet ingest snow and potential toxins altogether by always having a fresh bowl of water on hand. For pet parents who want to ensure their pets are warm, safe and happy this holiday season, there’s always Camp Bow Wow! As the leading pet care provider and boarding center in North America, our franchise owners have the privilege of spending the holidays with plenty of fun-loving furry friends. Would you like to set up Camp and provide pet parents in your area with a safe, stress-free place to bring their pups during future holiday seasons? If so, fill out the form below or contact us at 1-877-700-2275 to request your free executive summary. Check out the full article from Motherhood Moment here!